In which a recruit’s name is plugged into Google and the bits of information that trickle out–guru ratings, newspaper profiles, YouTube highlights, all that stuff–are synthesized in the hopes of getting a clearer picture of the player we’ll see at Auburn next fall. Previously: Jessel Curry, Craig Sanders, and Roszell Gayden. There were a dozen commitments over the course of the class of 2010’s recruiting cycle that told us “Hey … something special’s happening here,” but of those, maybe none has gotten less long-term mileage than Brandon Mosley’s. Mosley didn’t spend much time on the Auburn radar screen beforehand, was somewhat overshadowed by Roszell Gayden’s commitment the same day of his own, and saw the talk quickly shift to Cam Newton’s decision in the days that followed. But it bears repeating: when last December’s mini-Signing Day dawned, Mosley was supposedly leaning towards Ole Miss … if he wasn’t leaning towards Florida St. By that afternoon, though, pictures of Mosley in an Auburn cap were all over the place. And we knew once again that, hey, something special was happening here. 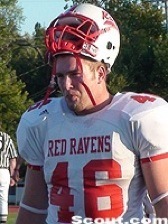 JUNIOR COLLEGE: In 2009 played mostly defensive end during the first half of the season and tight end the second half … Named to the All-Jayhawk Conference team as a tight end after having 12 catches for 229 yards and two touchdowns … Defensively recorded 35 tackles, including 4.0 for loss and 1.5 sacks. HIGH SCHOOL: Named to the Class A All-State First Team as a tight end as a senior … As a senior was also an all-region linebacker and punter, while earning all-region honors as a basketball player … Was an all-region tight end during sophomore campaign. So, if you’re keeping track, that’s tight end, punter, linebacker, and basketball star in high school, defensive end and tight end in JUCO, and the first position listed for him at Auburn is … offensive line. Which makes some sense, given that he’s listed at 6-6 and 285. Assuming his days of linebacking and defensive end-ing are done, Auburn’s got two very appealing options here: either a colossal tight end to mow opponents down on Malzahn’s various running plays on the edge, or (more likely) an offensive lineman with a lifetime’s worth of TE/LB/hoops-honed agility. I’ll take either. I’ve seen Mosley described elsewhere as having three years to play two, but I’m not sure that’s right; he took a redshirt his first year at Coffeyville, and I think the overall five-years-to-play-four rule means he’s only got two years at Auburn. Better put ’em to use. RECRUITNIK HOO-HA: It’s hard to believe given Mosley’s size and wide range of high school honors, but he was a total nonentity coming out of Jefferson in 2007; neither Rivals nor Scout nor ESPN bothered to even give him a profile. So the blooming for Mosley did come late. But hey, better late than never. ESPN doesn’t bother with JUCOs, but Rivals was plenty high on Mosley: four stars, a 5.8 rating, the No. 19 spot on their ranking of the class’s best JUCOs. Scout was less enthusiastic, giving him three stars and ranking him the fifth-best tight end in JUCO. 1. The offer sheet. Maybe snagging an Ole Miss offer isn’t a huge deal (the Rebels still offer a lot of kids), but serious pressure from Florida St. and a half-dozen total BCS offers–Arkansas, Arizona, the Kansas schools? That’s not too shabby. 2. Since both services are ranking him as a tight end, neither’s evaluation is going to hold a lot of water if Mosley does make the switch to the offensive line. Also, of course, there’s the omnipresent mitigating factor that, hey, Auburn’s coaches wanted him and wanted him fairly badly. That’s endorsement enough. LINKS OF POTENTIAL INTEREST: No embeddable video, unfortunately, and while there’s a link to film on the Signing Day bio sheet, I’m not able to get it to load. Maybe you’ll have better luck. Through his four years at Jefferson, Mosley made an impression as both a talented player and a workhorse. Mosley graduated from Jefferson in 2007 and was named to the 2006 All-Northeast Georgia second team as a tight end. He then became the only player from Georgia on Coffeyville’s roster. He was redshirted during his freshman year at Coffeyville and started having doubts about whether he made the right choice going to Kansas. He started to consider returning to Georgia and attending a school like Valdosta State. His coaches convinced him to stay, telling him that he would receive plenty of playing time and plenty of attention. They were right. The Kansas Tourism Bureau would like to have a word with you, Mr. Mosley. Aside from that well-worth-your-time profile, substantial Mosley links are few and far between, unfortunately. Chizik did say his “potential is unlimited” on mini-Signing Day. He received the Reb Russell Memorial Football Scholarship Award from Coffeyville after last season. He had a doppelganger playing safety at Indiana. Andrew Gribble believes Mosley is a “frontrunner” for quick playing time and makes his list of five “immediate impact” 2010 recruits. Previewing the 2007 Jefferson Dragons was in many ways an exercise in how they’d replace Mosley. Brandon Mosley, a defensive end prospect from Coffeyville Community College (Kans. ), named Auburn one of his favorites after his visit last weekend during the Iron Bowl. The Iron Bowl? No, it’s not a surprise you haven’t. WHAT CONCLUSIONS WE CAN DRAW, IF ANY: If Mosley was a ball, he’d be in Jeff Grimes’ court. For all his versatility, at Mosley’s size–285 pounds?–it’s hard to see him splitting out wide into that Tommy Trott/Phillip Lutzenkirchen role on Auburn’s offense. He’d have to line up as a more traditional tight end, at the end of the line, and though Malzahn’s used that kind of player regularly at Tulsa we didn’t see much of it last year. Everyone’s in agreement Mosley was recruited to Auburn to patch the ugly holes in the projected 2011 offensive line, and Grimes now has a huge, agile athlete with which he can do just that. And the guess here is that he will. Between Mosley’s transition to the offensive line and the four incumbents, I’m not seeing more than a backup role for Mosley in 2010, but give Grimes a spring, a fall, and another spring to work with an athlete with Mosley’s combination of size and skill, and you have to think he’ll come up with something. Specifically–given that at least four spots will come open–a starter. Where on the line, I wouldn’t dare a guess (tackle seems more crowded, so maybe he’ll be quick enough to play guard?) but I’ll be surprised if he doesn’t end up on the first-string somewhere. I don’t know about that last point, Jerry. And I hope you’re wrong. With that build, he could be a game changer at TE on day-one. Given he only has two years to play, and (I assume) that TE is a more desireable position, I would expect a legit shot at that position was one of his stipulations to sign with anyone. Also the fact that it seems he has more snaps under his belt as a punter than as a tackle/guard. Jerry, if graduated in 2007, redshirted a year in 2008, and then was an All-Conference JUCO player in 2009, by my math, that give him three years to play three… not just two. In other words, though he may have his JUCO certificate and be an academic junior, in football eligibility won’t he be a redshirt sophomore? Since he redshirted a year shouldn’t he have 3 years to play? Graduated spring 2007, redshirted fall 2007, played 2008 and 2009. By my calculations, that means two years to play two, since the overall rule is 5-to-play-4 no matter where those are played. Terrific job, as always, Jerry. Posts like these help us ex-pats through the long, cold Michigan winter. I think the overwhelming need for a short yardage set is in Gus Malzahn’s thought process here. Lutz on one side tight and Mosley on the other, both with good hands, and decent speed. Add to that the blocking ability of both, and one Ladarius Phillips, well you get the picture. Too many times last year Auburn needed short yardage and didn’t get it. The cure has arrived! With Mosley’s athletic ability, he could be a great pulling guard. It’s hard to find guards who can pull to either side and clear a path for a back beore getting swallowed up in the trash/mass of humanity that the 2nd level brings. To do that, you have to be fast off the ball and have coordinated feet, which it seems Mosley has. If they used him as a blocking TE, that would work as well, but the more athletic and quick your line is, the better.